As the smartphone ride-hailing service Uber explodes in popularity, it's becoming harder to count how many technology and service startups are aiming to become "the Uber of" whatever product or function they're providing - much as earlier generations of startups aimed to become the Amazon of this, the Facebook of that, and the Netflix of something else. 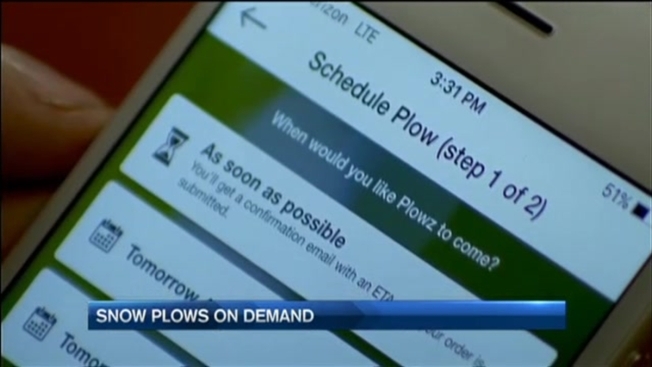 As southern New England gears up for its share of a storm Saturday that threatens to paralyze the mid-Atlantic, hundreds of plow operators are gearing up for possible business from a two-year-old startup that's quickly becoming the Uber of snow-plowing for people who don't want to lock in a contractor for a whole season. It's called Plowz & Mowz, launched in Syracuse, New York, "after my Mom was stuck in her driveway and couldn't get out,'' co-founder Wills Mahoney said. He's since gained investors to expand to 30 other markets, including metropolitan Boston. Jeff DeLine of J&R Lawns & Landscapes in Syracuse said last winter, when Syracuse was snow-deprived by Boston was buried under, he sent 5 crews with trucks east and the Plowz app enabled them to make $15,000 in a matter of days. "It wouldn't have been feasible to travel there and do that based on the amount of work that we would have had to do to gain customers over there at the drop of a hat,'' DeLine said. If you worry that a first time plow guy might take out your fence or rip up the grass: The app lets you upload pictures and instructions. Like Uber, plow operators all get rated, and the ones who disappoint or anger too many customers will get booted. As the name suggests, it also connects customers with lawn mowing contractors on the other side of the year. "We know the model works, and we really want to scale up,'' Mahoney said. With video editor Lauren Kleciak. Material from CNBC and CNBC.com was used in this report.